The transportation industry is changing and evolving with a plethora of new technology available. What does this technology mean? It means there will be more options for travel and transportation as smart cities evolve, parking options change, and the industry expands. One such technological breakthrough is the advent of autonomous vehicles for daily transportation. Ride-sharing company Lyft is currently working with Aptiv, a global technology company that develops connected solutions, enabling the future of mobility. To see how this technology is advancing and how it operates the vehicles autonomously, click here for video. These autonomous vehicles were introduced to the Las Vegas market when Aptiv partnered with Lyft during the CES 2018 show at the Las Vegas Convention Center. 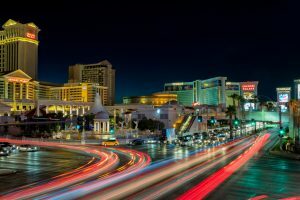 They provided an opportunity for attendees to test this new technology by summoning an autonomous ride in a BMW, which transported riders to several properties on the Las Vegas Strip. Currently Lyft is offering autonomous vehicles as an option in Las Vegas through its app. How does this work? If a self-driving vehicle is the closest vehicle to the rider’s location and the rider has opted in to the self-driving pilot program, they will be sent an autonomous vehicle. These vehicles currently pick up at standard ride-sharing/TNC locations throughout the resort corridor and will expand to additional locations in the future. The autonomous vehicles have drivers and co-pilots, who operate the vehicle while it is in pickup and drop-off mode until the vehicle is safely back on the open road, where it is switched back into autonomous mode. Uber has similar technology and is currently testing autonomous vehicles in San Francisco. Several automakers are also looking at autonomous technology and exploring what part they will play in this advancing industry. The future of transportation will never be the same as technological advancements evolve and new products continue to enter the market. Are you ready for the ride? Maria Tamayo-Soto, MBA, is traffic manager with the Las Vegas Convention & Visitors Authority.